Last night, Maks and Val Chmerkovskiy won an Innovator Award at the Industry Dance Awards. Derek Hough also won for America’s Favorite Choreographer. Derek didn’t attend the Awards, but, below is some photos and a video with Peta, Jenna Johnson, and Maks and Val Chmerkovskiy. You can see Tommy Chong presenting with Peta too. ETA: Added to the coverage below is an Entertainment Tonight interview with Val at the Industry Awards last night. He talks on his summer, being in live with Jenna Johnson, and more. What a night for Dancing With The Stars Derek and Julianne Hough at the Microsoft Theatre in Los Angeles, California last night! It was a packed house for their Move Live On Tour! What’s more, friends and fellow celebrities came out to support them….Nappytabs, Kenny Ortega, Paula Abdul, Nicole Scherzinger, Elizabeth Berkley, Nina Dobrev, Maria Menounos, Tommy Chong, Shirley Ballas, Brooks Laich and more! Elizabeth Berkley tweeted that it was “the most amazing night of incredible dance” and “what a gift to witness such extraordinary talent.” To read more on the night, see Pure Derek Hough here and here. Below are some high quality photos from the night as well. To see more photos, see Getty Images. Here’s a stunning shot courtesy of @MicrosoftTheatre as well…. DWTS Season 19, Week 10: Dancing by the Numbers! Wow. The last week. The second to last numbers post until March. Yay!! I will hopefully be able to whip up a numbers post on Monday night after those scores have come in and will take into account whichever screwy way they decide to count the votes. Anyway, their convenient ranking of the contestants the other night makes it harder to call than you might think. I’ve been of the opinion for quite some time that Janel is the low vote getter of the people left standing (hell, maybe she got less votes than Tommy, but who knows). But the scores are equally important and the question is: is she getting enough votes to prevent Sadie, Bethany and Alfonso covering the spread? That’s the big question. Between the very young fanbase of Bethany (less likely to vote) and the broad appeal of Sadie and Alfonso, is Janel’s score enough?? Well, it will be an interesting Monday night. Maybe. What I mean by that is – when will they eliminate the fourth place person, Monday night or Tuesday? Last season, according to Wiki, they eliminated James on Monday night after all the dances. Bill Engvall was eliminated on Monday night. Aly was eliminated on TUESDAY. However, Aly’s season was the last one where there was a regular Tuesday night show. So, it should be Monday night – but the producers of this show have a tendency to change things around to suit their purposes. But for right now, we’re going on the assumption of a Monday night elimination, which makes these scores pretty important. Well, as you can see the percentages are pretty close together, which means not a lot of votes will be needed for someone to get beat. See, this is why it’s tough. There hasn’t been a real bottom two all season. Janel and Sadie have been the last woman standing on a couple of occasions –sometimes that means something and sometimes it doesn’t. It never means anything during the semi-final and finals nights, so that leaves Sadie and Janel each with one instance of being the last person called safe. Betsey was in the bottom two and was eliminated two weeks later. Jonathan was last to be called safe and was eliminated two weeks later. Michael was last to be called safe and was eliminated four weeks later (thanks to goofy eliminations). Tommy was last to be called safe and was eliminated two weeks later. Janel was last to be called safe four weeks ago and was handed bogus immunity two weeks later, and was wildly overscored the two weeks after that. Interesting. 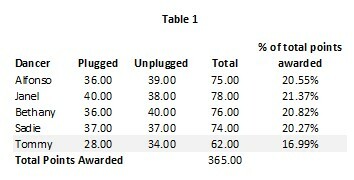 Sadie was last to be called safe the last two weeks, but as I said, it doesn’t usually mean anything in the semi-final. That may be true for the quarter final as well, but I can’t remember and I’m too lazy to go look it up. So, does this mean that either Sadie or Janel are going to be eliminated Monday night? Well, no, not really. We don’t really know if jeopardy means anything in a given season until that season is completely done. But, we’re pretty close right now. Based on this knowledge, and the fact that he’s awesome, I’m going to bet that Alfonso is safe on Monday night. That leaves us with the three ladies. Now, I think it’s fairly clear that Bethany has the largest actual following from BEFORE DWTS. And I kind of feel like Sadie’s gotten the lion’s share of the average viewer. Which kinda leaves Janel out in the cold. Sure, I would like to see Janel eliminated, but that’s just to hack off Val. Really, if you’ve made it to the finale, there’s winning and losing. Unless you’re holding the trophy at the end, you lost – does it matter what place you got? Not really. All that just to say that I don’t really care if Janel gets fourth or third. And to also say that if Bethany isn’t holding the MBT at the end (and she won’t be), who cares ifshe gets fourth or third or second?? Now, it could come down to Sadie and Janel or Bethany and Janel. But look at those vote requirements. I think that Sadie beats all three of them with the possible exception of Alfonso. Then Alfonso beats both Bethany and Janel. Then Bethany beats Janel. Now, that’s the very short version, but if you followed it, that means Janel is eliminated. BUT, it’s entirely possible that Sadie only beats Janel in with the above scores. Doesn’t matter, right, because it’s likely that Alfonso beats Bethany and Janel and Bethany beats Janel, which means Janel goes home. But what if Sadie isn’t beating Janel, since that more than 10k could be a stretch?? Bethany gets 5,500 more votes per million votes cast than Janel. Sadie fails to get 2,800 more votes per million votes cast than Alfonso. 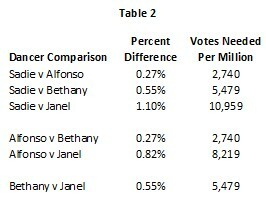 Bethany fails to get 5,500 more votes per million votes cast than Janel. Now do you see why it’s so hard? None of those numbers are huge. In looking at all three combinations, it strikes me that, initially, it looks like eliminating Janel is the hardest thing to do. But then look at Beth and Sadie – it seems like Janel has an easier road, but when you look at Sadie’s set, it seems to me that she could beat Alfonso and Bethany with those numbers, but it’s also a bit hard. Then you look at Bethany and it doesn’t seem like it would be hard for her to beat Janel even if Sadie and Alfonso are beating her. That is why I keep coming back to Janel. Sadie might not beat Janel, but she beats Bethany (theoretically) so she’s safe. Sadie might beat Bethany, but I think Bethany beats Janel so SHE’S safe. And that leaves Janel out in the cold. But remember, I only have to be wrong by a TINY bit for someone else (either Bethany or Sadie) to go home. At the end of the night, I think Janel will be eliminated. If not Janel ,then Bethany. Third choice is Sadie. ETA: In re-reading what I wrote last night when I was exhausted from traveling, I felt I needed to make a couple things clear and add a note. First – while I think it will come down to Janel and one of the other girls, they may not SHOW that. IF Janel is safe on Monday night, expect to see her called safe first and see Bethany and Sadie standing next to each other under the red light of doom. Either Bethany or Sadie COULD be ahead of Janel in the finish, but if they are really interested in pimping Janel to the trophy, they will call her safe first. It’s a subtle form of manipulation. A darkened ballroom, ticks counting down on the clock! The switch was flipped, lights shining bright as the sun! AN ELECTRIFYING, ENERGIZING EVENING OF DANCE! AN ELECTRIFYING, ENERGIZING EVENING OF DANCE, greatness personified! A DANCING PAIR, TOMMY AND PETA TOOK THEIR FINAL BOW! AMERICA’S HERO GAVE US A DAZZLING TREAT, WE SAID WOW! THE TWO-NIGHT SPECTACLE NEXT WEEK, HOW CAN IT BE! EPIC, EXTRAORDINARY DANCES, FREESTYLES WE WILL SEE! Below is the new Afterbuzz TV show. This time Mandy Moore joins the gang to review the Dancing With The Stars Semi-Finals. First up, Mandy clears up how she’s not just helping one couple for the Finale, but, she’s been helping all of the couples all season with her advice since she is the “Performance Producer” for the show (Hmmm….say what you will, but, I still don’t think it’s right that she’s helping to choreograph one couple’s dance for the Finale). I also loved what the panel said on Allison Holker at the end and how she is an “animal”. I agree with Jake when he said people like Allison, Witney, and Derek, etc. are and have helped to shape the show into more than just “ballroom” dancing. I hope Allison gets another shot at being a pro too. Lot’s of content to think about again below with their opinions. Let us know what you think…. Carrie Ann Inaba has written a new blog at Parade. She writes on all of the couples again for their strengths and weaknesses. One thing I don’t agree with though is when she writes that Alfonso and Janel are the best dancers. Maybe Alfonso, but Janel? Sadie and Bethany have been the better dancers in my opinion. Let us know what you think in comments. However, the diehard dancing fans, the ones who want to see only the best dancers in it to win it, will be happy that next week, the final four will be Bethany, Sadie, Janel and Alfonso. Diehard fans are super-excited because this is going to be a close one. All four have the potential to win it this season! In my mind, the best two dancers—the ones with the most polish and highest scores so far—are Janel Parrish and Alfonso Ribeiro. The two dark horses are Bethany Mota and Sadie Robertson. But this is an interesting year. Our social media presence has grown and people are voting and getting involved in our show in new ways. We have a broader audience now, a younger one to enhance our extremely steadfast family of viewers who have stayed with us all these years. (And I thank you for that!) We love our fans. They have become our family! But the two dark horses have big fan bases that are younger and more social media savvy. This could make the finale interesting. In the past, we’ve had younger stars (Cody Lindley and Sabrina Bryant, for example) with incredible fan bases. Their dancing was worthy of making the finals, but their fans didn’t stick with them. This year, it feels like the fans are here! They are making their presence known. I see it in my twitter and Instagram feeds and on my Facebook and whosay pages. This is the face of the new generation of DWTS fans. Welcome! More at Parade. Note that she says the judges have picked the Jive for Alfonso and Witney’s Judges Choice dance. And how about this dress? I loved it and her shoes….